Celebrity engagement rings are not for those with weak heart, because they are always bigger, brighter and more expensive then the previous ones so it is very difficult to follow all of that fuzz and stay calm. Be we like celebrity world, especially their engagements and weddings. The bigger celebrity couple is the bigger ring will be. All the diamonds shine brightly, but some of them shine more than others. The bling-tastic engagement rings decorate the glowing manicured hands of several of the world’s most famed women, and a lot of them hold price tags value more than some big expensive houses. These diamond rings are design with most beautiful and astonishing diamonds in the world, but because of their wealth these women aren’t frightened of losing their diamond rings down the sink while clean the dishes. Let’s be honest, what actress has time to clean the dishes when she is the celebrity. Diamonds are certainly forever, but some of these marriages may not last long. Some of the fresh examples are: Katie Holmes and Tom Cruise, Heidi Klum and Seal, Cheryl Cole and Ashley Cole. They are no longer with their jewels, but we always can gasps over the pictures. And there are a lot of most famous celebrities like Beyonce, Jennifer Garner or Victoria Beckham who still wear their sparkling expensive diamonds engagement rings, but which of those you prefer the most, and do they ever going to sell those diamonds rings? Answer to this question you can find if you look for specialist diamond buyers. So, is it a heart shaped diamond engagement ring? Square shaped engagement rings? Or maybe some unusually shaped diamond ring? Oscar award winner Ben Affleck stated his eternal love for wife Jennifer Garner with 4.5-carat gem. Affleck previously bought giant engagement ring for Jennifer Lopez, but these two canceled their wedding at the last minute and the ring was sold in 2005. 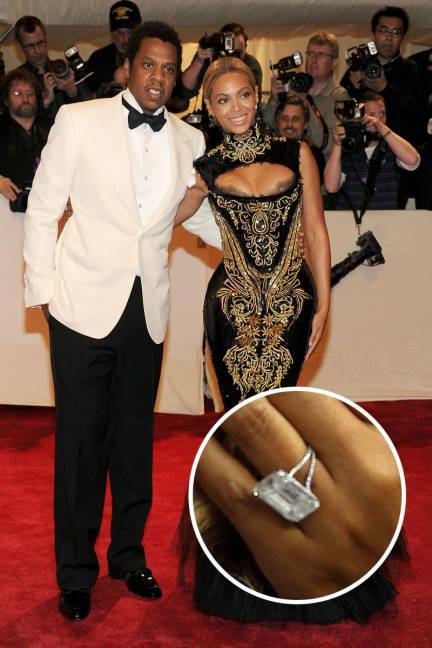 Jay-Z didn't just put a ring on it - he proposed his wife-to-be Beyoncé with a huge 18-carat diamond ring. The couple married in 2008. This beautiful diamond was designed by Lorraine Schwartz for the price of $5M. After few years of dating, Brad Pitt asks the question with 16-carat custom-designed Robert Procop diamond ring. Experts estimate the ring cost around $250,000. Ryan Reynolds is known as big heartbreaker, but Blake Lively keeps this stud in her stable. Though they handle their engagement and wedding very private, there's no way Blake Lively's Lorraine Schwartz astonishingly beautiful diamond ring be able to go under the radar. Their marriage unfortunately ended in 2012, but at the time of love and affection Seal gave gorgeous yellow 10-carat engagement ring to Heidi Klum on top of a glacier. This is a very well known story. They are one of the most talks about newlyweds. Justin proposed to longtime girlfriend Jessica Biel with this vintage-inspired six-carat diamond. Jessica Biel has revealed that she had absolutely ''no say'' in what her $130,000 engagement ring looked like - Justin Timberlake picked it out all by himself! One of the most famous football players in the world David Beckham sealed the deal with this massive diamond-encrusted engagement ring. But Victoria Beckham recently has changed her gorgeous 3 carat marquise-cut engagement ring surrounded by a huge number of diamonds with an emerald-cut Chopard engagement ring. That engagement ring is reported to have 19 carat. Love between these two is blooming even after almost 10 years. 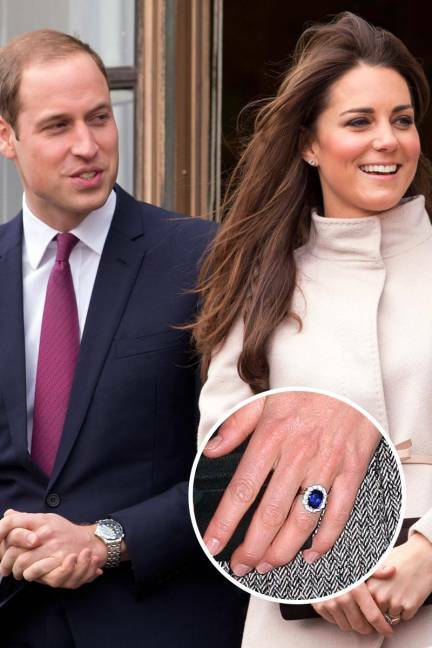 With its oval blue sapphire surrounded by a cluster of 14 diamonds, the ring Prince William has given Kate Middleton is among the most famous in the world. Lady Diana Spencer chose it for her engagement to Prince Charles in 1981 from a selection presented to her by the then Crown jewelers Garrard of Mayfair. It cost £28,500 but, unusually for a choice by a member of the Royal Family, it was not unique and any member of the public could buy the same ring from the Garrard catalogue. Brazilian beauty Gisele Bundchen received beautiful 4-carat diamond engagement ring from football star Tom Brady. It's a completely spectacular ring, but if you consider that she's the biggest supermodel in the world then you know why Tom Brady needs to go that far. Nick Cannon proposed to pop diva Mariah Carey with a stunning 17-carat emerald-cut pink diamond ring surrounded by 58 pink diamonds. Experts estimate the ring cost around $2.5 million. But, apparently Mariah was very upset when it was claimed the ring was secondhand and had been used on his previous fiancée. The couple arranged disputes and married in 2008. Amazing stories! Break ups and make ups! These couples deserve these kinds of things. There are a lot of other couples that I would like to hear about. I hope to see it here too. All gorgeous! Personally I like Jessica Biel's, it's really ornate and pretty and looks kind of unique. Royalty speaks for itself, the blue sapphire bordered by 14 diamonds tops the list for me. The perfect choice for weddings & engagements is a beautiful diamond ring for the newly wed.
Diamond are the most precious and amazing gift in this world, they look very pretty and if the one who wear them is also beautiful then it will definitely increases the value of diamonds.